Alexandria is located in the neartheastern tip of the Northern Virginia region on the banks of the Potomac River. Alexandria is primarily known for its rich colonial history and includes attractions where our nation's founding fathers frequented, such as Gadsby's Tavern and The Lyceum Historic Site and Museum. 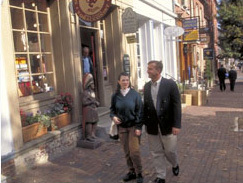 Historic Old Town Alexandria is a bustling center of retail and features a district consisting of colonial-era architecture and cobblestone streets. Just outside of Old Town are 13 large modern shopping centers, too.